For more than ten years, parenting experts, child product safety organizations, and new parents have been talking about the potential safety hazards of using traditional crib bumpers inside infants’ cribs despite the benefits of preventing head, arm and leg injuries. We are Dale and Susan Waters, married entrepreneurs from Minnesota who turned fear for our baby’s safety inside her crib into a mission to create something that would not only help protect babies but also provide peace of mind for parents. We invented the Breathable Mesh Crib Bumper; a product designed to reduce the risks of suffocation caused by traditional bumpers, while protecting a baby’s limbs from becoming entrapped in the crib slats. 12 years ago, we woke to the sound of our 3-month-old daughter screaming in agony from her crib. Our daughter, Sierra had gotten her legs twisted and wedged between the slats of her crib. Her face was pinned against the mattress. There were many sleepless nights for us and our daughter – no matter what we tried she kept getting her little arms and legs caught between the crib slats. In addition to the obvious pain of being stuck, we feared she would break an arm or leg, or develop neuropathy. But we refused to use a soft, pillowy crib bumper for fear of suffocation. Research shows that a baby can snuggle up right against their crib bumper. If the baby’s nose and mouth are too close to the bumper, it can potentially cause dangerous re-breathing of carbon dioxide or suffocation. A baby can also get wedged between crib slats and the mattress, unable to escape and possibly suffocate. Because the safety and potential dangers of crib bumpers has been in the news recently, many parents are unsure about how to keep their babies comfortable and safe. As parents, we were frustrated and upset to learn there was no practical solution available in the marketplace. As designers and entrepreneurs we decided we had to do something about it and devoted ourselves to developing a safer, “breathable” solution – preferably one that was affordable and easy to use. So, we took a break from the media, marketing and music company we owned, and focused on creating a safer solution for babies. We researched and sourced fabrics, designed and engineered prototypes, held focus groups with mothers and sought extensive third party safety evaluations by a world-leader in safety consultation before finally introducing a safer, smarter crib bumper to the market three years later in 2002. What makes BreathableBaby bumpers so much safer is our Air Channel Technology™ (A.C.T.) designed to prevent suffocation. A.C.T. maintains air access should a baby’s mouth and nose press up against the fabric. When the BreathableBaby fabric is compressed it is virtually impossible to form an airtight seal. In fact BreathableBaby has “fabric cards” available so that parents can experience the A.C.T. safety feature for themselves — just send in a request along with your address information to customercare@BreathableBaby.com and we’ll send you one free of charge. Since its launch, we’re proud to say that the BreathableBaby™ brand has forged a new category in “breathable” bedding, and is embraced by parents worldwide. Our products have won numerous awards including The Child Safety House Calls Award of Excellence, and National Parenting Center Seal of Approval for innovation, functionality, design and contribution to creating a safer, healthier crib environment. It’s imperative that parents are aware of the potential dangers that may be part of a baby’s sleep environment. 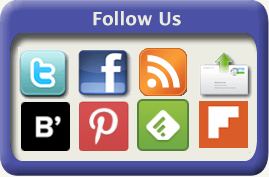 New information is available all the time, so we urge all expectant parents – first time or otherwise – to seek relevant news, alerts, studies and guidelines from news and safety organizations such as the ones listed in our Healthful Hints below. Wishing you and your little one sweet dreams. Crib Mattress Should be Firm. A soft mattress may increase suffocation risks. Select a firm mattress that fits the crib tightly and a fitted sheet. You should have a fitted not be able to fit more than two fingers between the mattress and the crib side. 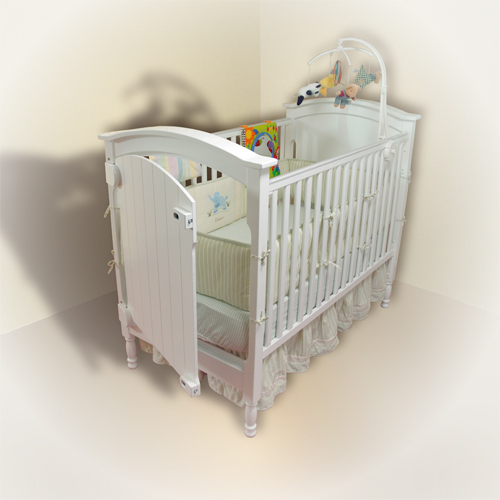 Before purchasing a crib, visit www.cpsc.gov to make sure the crib you selected has not been recalled. No Blankets for Baby. Do not place anything in baby’s crib that could be a suffocation hazard, including blankets. If you’re worried about keeping your baby warm, a better solution is an infant sleeper or wearable blanket that zips around your baby and can’t ride up over her face. 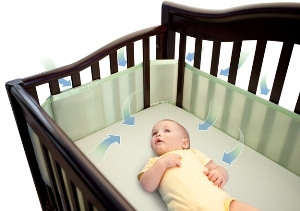 Breathable Mesh Crib Bumpers. Crib bumpers that are plush, pillowy, and made of non-breathable fabric can increase the risk of suffocation. A safer crib bumper option is one that is mesh or breathable and allows for air flow – even when pressed against a baby’s mouth. De-Clutter the Crib. For most parents, all those cute stuffed animals and soft blankets might seem a natural fit for the crib, but unfortunately they all pose suffocation risks. Toys and stuffed animals are best saved for interactive play time. A bottle. Parents of older infants who have started holding their own bottles may be tempted to slip a bottle into the crib in case their baby wakes at night. But even a bottle can pose a suffocation risk. Plus, babies who fall asleep with a bottle in their mouths are prone to tooth decay from the milk sugars that sit on their teeth all night. Pacifiers. Some studies have shown that giving your baby a clean, dry pacifier reduces SIDS rates. I used something just like this years back when i had my kids. I was way too scared because my son loved pushing his face up against the edge. Great recommendation! Awesome work on the product! Will you be offering this on Amazon any time soon?